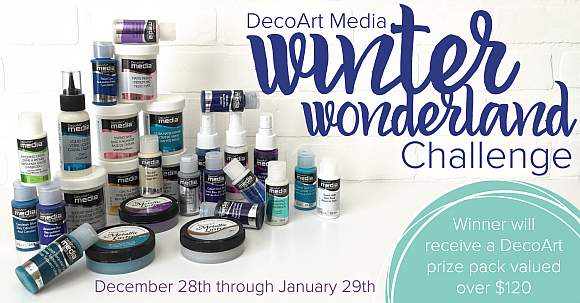 Are you ready for another DecoArt Media challenge? This challenge will be a winter theme full of blue and purple hues and maybe even some snow! Our Mixed Media Design Team has been busy creating some great inspiration pieces that we will be featuring daily, so get ready for some fantastic project ideas starting December 28th. We can’t wait to see where all your creative ideas take you! Congratulations to our lucky winner Joi Schultz! The DecoArt Mixed Media Design Team loved her interpretation of the Northern Lights! A great line-up of talent, looking forward to seeing their creations! Mark's wand is fabulous.. Looking forward to seeing all the inspiration. Please excuse my ignorance... but how does one enter this contest? Just by uploading a photo of a piece? Thank you. Linda B.
Sabine, I too, have submitted a photo and do not see it. Mark, I did not see a space for listing supplies used; where is it? Hi. If your entry doesn't come up straight away it will. They are checked daily and added. Maybe a little more time Iver a weekend. Lynn. Just list on your blog post what you have used somewhere x Linda B. All you need to do is create a new Crafty project using some decoart products. List what decoart products you used somewhere on your blog post. Then link up by adding a link to your blog on the link button x. Thanks for the awesome contest! The DT creations are stunning! I linked up my project, but the thumbnail is not showing. Judging from the comments above, I can trust it will appear in the future, hopefully before close of the challenge! Here is my link http://sarascloset1.blogspot.com/2016/01/oh-baby-its-cold-outside.html Awesome mixed media pieces from the Design Team! I'm slowly making my rounds to see them up close. What fun I had making my project! Hugs! I really enjoyed this challenge and love the media products. Not seeing my image yet but then I just linked it today so I am thinking I will soon. The design team was a great inspiration and am enjoying all the ideas everyone came up with. Good luck to everyone who entered! I accidentally added the same piece twice, but under different blogs. I was afraid my first submission didn't take. Feel free to remove the duplicate entry. Sorry for any inconvenience. thanks for the super fun challenge and awesome inspiration from all of the fantastic designers! You couldn't have picked a better winner! Congratulations, Joi! Your painting is awesome and you deserve this!!! There are some beautiful pieces of art here!! !